Price: 140,- or pay what you want! Sacred music from the Tudor Period, the early English Renaissance. The programme is centered around Missa Tecum principium. It is perhaps the most beautiful work by Robert Fayrfax, especially the final Agnus Dei movement. The mass is interlaced with excellent pieces by other masters of the English Renaissance: Byrd, Farrant, Ferrabosco, Tallis og Tye. 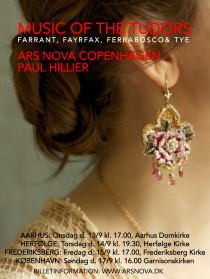 The vocal ensemble Ars Nova Copenhagen adds a special, pleasant sound to the English Renaissance music - and a sophisticated interpretation.